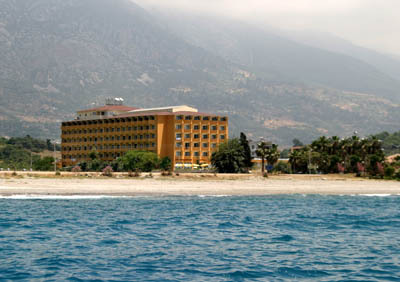 Situtated in Alanya-Kestel, Alanya is just 7 km, Antalya airport 125 km away. 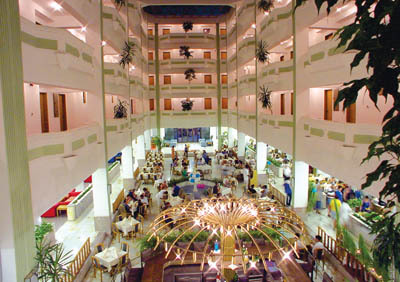 Reception * lobby * main restaurant with non-smoking area * 4 bars * oriental corner * outdoor swimming pool with children's section * TV room * conference room. 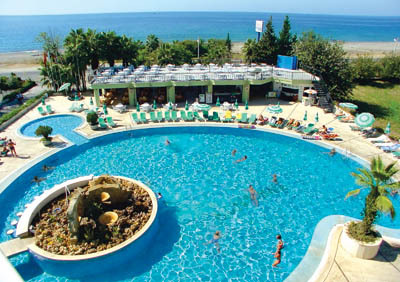 Beach volleyball * table tennis * darts * tennis court * Turkish bath. Imported drinks * fresh fruit juices * ice cream * safety box * massage * internet café * billiards * sauna * disco * room service. Air-conditioning (split) * balcony * minibar * satellite TV * bathroom with hairdryer * telephone. Hotel is situated right on the sandy beach (private under - pass beneath the coastal road). Sunbeds, mattrasses and umbrellas free of charge, beach towels payable locally. Beach bar. Unlimited soft and alcoholic local drinks between 10.00-23.30. Open buffet breakfast, lunch & dinner. Late breakfast, snacks in the afternoon, coffee/cake, midnight soup.